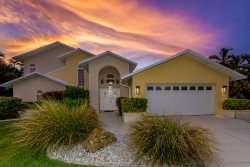 Villa Mermaid Basin located in the desirable Yacht Club Area of Cape Coral. Minutes away from the Cape Coral Beach, "The Boat House Restaurant" as well as the public boat ramp. This 3 bedroom 2 bathroom vacation rental property features tile throughout the house, lots of natural light a typical Florida Style kitchen with a large living room featuring comfortable furnishings and a large flat screen TV. The large sliding glass doors lead to the covered and screened in under truss lanai which provides breathtaking views of the waterfront basin and intersecting canals. The swimming pool is not covered by a lanai which makes sunbathing that much easier. The property features a large wrap around boat dock and lift as well as a nice tiki hut on a separate dock that can be enjoyed for relaxing, enjoying some shade or fishing. This property is located on a sailboat access canal system and as only about a 10 minute boat ride out to open water. Unsere Villa Mermaid Basin liegt in einer der beliebtesten Nachbarschaften von Cape Coral -- dem Yacht Club. Von hier aus sind es nur wenige Minuten zu dem Cape Coral Yacht Club sowie dem Boat House Restaurant und dem Cape Coral Pier. Das Haus selber liegt am Ende einer ruhigen Seitenstrasse, auf einem ueberdimensional grossem Grundstueck. Das Ferienhaus Mermaid Basin bietet 3 Schlafzimmer, 2 Baeder eine geraeumige Kueche sowie ein grosses Wohnzimmer mit gemuetlichen Moebel und einem grossen TV. Viel natuerliches Licht, helle Fliesen sowie einen Atemberaubenden Blick von dem Wohnzimmer auf den Swimming Pool und dem dahinter liegenden Kanal. Die ueberdachte Terrasse ist mit einem Screen ausgestattet waehrend man in dem Swimmingpool direkte Sonne geniessen kann. Von der Terrasse hat man eine tolle Aussicht auf verschiedene Kanalkreuzungen sowie dem Haus eigenen Tiki Hut. An der Seite des Hauses befindet sich ein weiterer Bootslift sowie ein Dock welches perfekt zum fischen benutzt werden kann. Splendid view in a very quiet neighborhood. Safe, clean and very well supported by Vesteva people. Mr. Orlando and Vanessa were very helpful and with an excellent attitude. They help us to have a great time. Also Jason the plumber. Thanks! !